This is a wonderful alternative to regular deviled eggs. 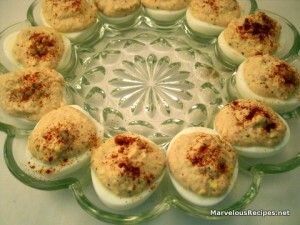 The deviled ham gives these eggs a delightful country flavor! 1. Slice the eggs in half; carefully remove the yolks into a small mixing bowl. Mash the yolks with a fork; stir in the deviled ham, mustard, mayonnaise and salt, mixing until creamy. 2. Spoon the mixture back into the hollows in the egg whites; sprinkle with a small amount of Paprika for color. Makes 12 halves, each with 1 gram carbohydrate, a trace of fiber and 4 grams of protein. I’ve never tried Deviled Ham, I’ll have to try these! Are you going to join Jeannie’s Queen Challenge with me? Hello Emily. Just a visit to say hello and check out your latest recipe. This sounds so good.